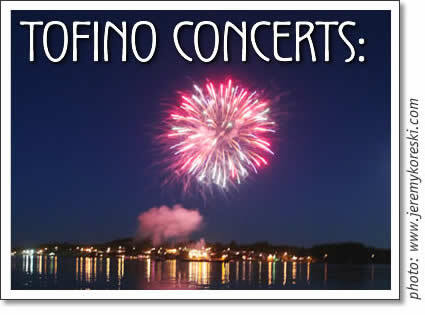 The following concerts are happening in Tofino in the month of March. Tickets are available at Tofitian, Esso and at the Common Loaf. CR Avery's shows are a rock with spoken word/hip-hop influence. The show opens with a lone man walking on stage. He tests that the mike is on and the audience listening by blowing a few sweet, easy notes through his harmonica. Cheers ring out as a wave of electricity runs through the crowd. The man next reaches around his back to produce a small, red, guitar-shaped keyboard. The crowd's cheer reaches a roar as he is now playing keyboard, harp, and beat-boxing, becoming a one man band. Then he starts singing. swarm, the extreme percussion orchestra, presents theatrical shows of invented instruments, original music, comedic vignettes and intense physical choreography. The performers play and spin the wheeled sculptures about the stage, while leaping and dancing around them. This is a high-energy acoustic show featuring many elements of the school show plus more of the action drumming choreography for which swarm is famous. The wheeled instruments allow the stage to be set up and torn down in five minutes. The performers create a high-octane show. When asked what his sound is, Phonograff replies "its hiphop, roots reggae, dub, Latin jazz, electronic music fused into huge hiphop beats with heavy bass, warm elements, all the while keeping the turntablism and scratching in the mix." Whoa The Phonograff is Mike Jones (real name folks!). The Phonograff has been DJ for over a decade. When Phono realized that he was able to cut a living out of making music, his path was forever changed. The show will also include island MC Demoe One. The Beautiful Girls are at the forefront of the new roots and groove music movement. Both live and on record they manage to blend their affection for hip-hop and reggae with their love of real blues and roots. The band brings a mellow and foxy feel to everything they touch. They rap to a resolectric, rocksteady with an acoustic and they do melody like nobody else. They will be visiting us on their North American Tour as they take some time away from their native Australian turf. Don't miss this chance to see these up-and-comers. Tofino concert schedule for March 2006: Bocephus King, C.R. Avery, Swarm, Phonograff, and The Beautiful Girls in Tofino.